You witness an adult collapse to the ground, what do you do? 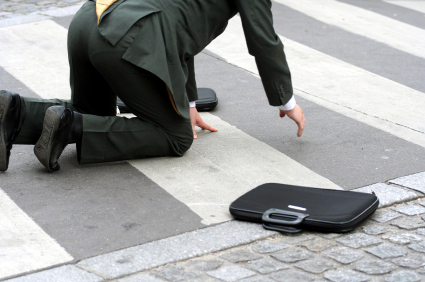 What would you do if you witnessed the sudden collapse of an adult? Would you just stand-by and watch? Would you call 911? Would you initiate CPR? Research reveals that bystanders have been reluctant to perform CPR on a person who drops to the ground because they are hesitant about putting their mouth on a stranger’s mouth. Even without CPR training you can save the life an adult whose heart stops. You only need to push hard and fast on the victim’s chest. Push hard and fast in the middle of the victim’s chest, with minimal interruptions. This recommendation is based on evaluation of recent scientific studies and consensus of the American Heart Association Emergency Cardiovascular Care (ECC) Committee. The American Heart Association encourages everyone, trained or not, to act immediately in such an emergency. As health professionals, we’re trained in CPR and performing CPR is something we don’t even think about. We respond automatically if a patient’s coding in the hospital or if we encounter someone who suddenly collapses on the street or is unconscious. Our training is extensive. For the layperson that has no training, it can be scary to think that all of a sudden you witness someone dropping to the floor and you’re going to be pushing down hard and fast on their chest. By acting quickly and initiating Hands-Only CPR, the victim who lies motionless, could be someone’s dad, mother, grandpa, grandma, brother, uncle, son, sister, aunt, daughter; someone who has a family to get back to. You can help literally save this person’s life. While it might be frightening, you can be in charge and initiate Hands-Only CPR right away. This person will have a greater chance of surviving because you started CPR before the professionals arrived. Here are my tips to help you get started, and to help relieve any uncertainty you may have. Any victims of drowning, drug overdose or collapse due to breathing problems. Step out of your comfort zone. Learn about Hands-Only CPR. It’s easy to do and you can literally save someone’s life. You’ll be the one in charge before professional help arrives. So remember, call 911 or instruct someone else to call, and push hard and fast in the center of the victim’s chest. We’d love to hear from you. Have you ever given CPR to someone who collapsed? What was your experience like?